This has become an accepted way of proceeding in New York, even for subsidized institutions that are supposed to serve a public purpose. Barclays Center at Atlantic Yards, in downtown Brooklyn, was sold to the public in an elaborate bait-and-switch scheme as part of a spectacular “urban utopia” complex to be designed by Frank Gehry. It ended up instead as an arena with all the charm of your basic bus terminal, home to an unwanted basketball team owned by a Russian oligarch. But then, as with any major New York development today, some form of deception is requisite. The Atlantic Yards scam was bankrolled with hundreds of millions in public funding—though the chicanery here is so involved that no one can even say for sure what the final public subsidy figures will be. The project includes at least $100 million forfeited when the MTA, which has a subterranean train-marshaling yard there, sold its lucrative aboveground rights to the site to the developer Forest City Ratner, which was the lowbidder for them. Hundreds of local residents have already been relocated, and before the whole charade is over, thousands more may be displaced from their homes, dozens of longtime neighborhood businesses will have been shuttered, and community leaders will have been shamefully compromised with emoluments ranging from a luxury-box giveaway to an on-site basketball arena “meditation room.” But in a brilliant piece of political legerdemain, no elected official was forced to actually vote for the project. 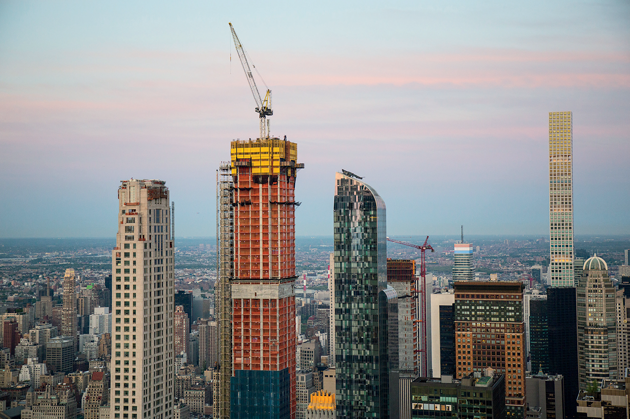 2 A more human-size new plan, including 1,100 apartments for low-income New Yorkers, has since been announced by Mayor de Blasio, which is a welcome development—but still not one that will resurrect hundreds of bulldozed family businesses. 3 When he said this, and before he was rewarded for his outspoken racism with endless magazine assignments and book contracts, Roger Starr was New York’s housing commissioner. Of those 200,000 units, it developed, 120,000 were to be “preserved,” mostly by negotiating with landlords to rehabilitate buildings that had fallen into extreme disrepair or were seized by the city for back taxes. Crucial as this sort of work is, it only stanched the bleeding. The remaining 80,000 new units of affordable housing would start to materialize with De Blasio rezoning fifteen neighbourhoods for higher-density habitation. The Bloomberg Administration had taken another approach, rezoning more than a third of the city but more often “downzoning” neighborhoods to limit housing capacity and preserve their “character.” Unsurprisingly, the downzoned neighborhoods tended to be whiter and more well-off than those that were upzoned, but ultimately a net of 15,000 buildings and 170,000 housing units were added during Bloomberg’s three terms. This approach, as well, did absolutely nothing to contain rents.